This is the sixth week of The Yuck Stops Here link party. Please remember that this is a RECIPES only party, recipe tips are welcome, but crafts, etc. belong somewhere else (not that we don't LOVE them, we're just sticking to recipes here)! We've changed our start and end times! The party now starts every TUESDAY evening at 8pm Eastern Time and ends the following Sunday at 8pm ET. That gives you plenty of time to link up and to visit each other's awesome posts! This Weeks Features: The Most Clicked Post was: Bean and Cheese Tostadas with Roasted Tomatillo Salsa from Hello Little Home. Pop over to check out this yummy recipe and some of the other fun things Ginnie is doing. The time you spend there will be well spent. Congratulations Ginnie! Don't forget to grab your "I Was Featured" button. 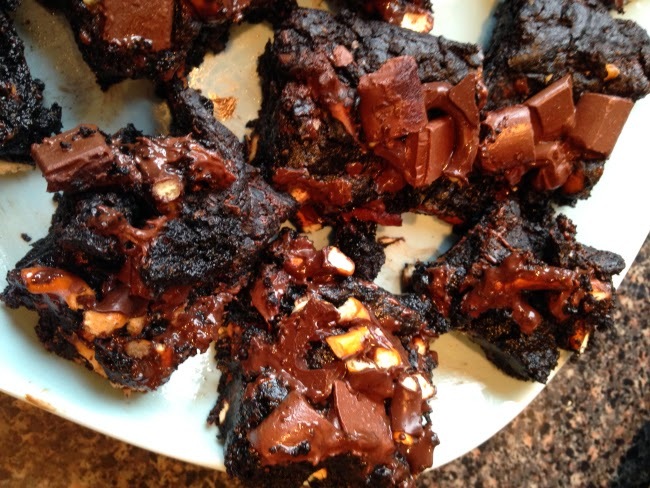 Don't these Dark Pretzel Brownies look delicious! My featured recipe this week is from Haley. Haley writes the blog, Egginon and her blog is full of great recipes such as Pumpkin Ravioli, Gingerbread Waffles, and BBQ Portobello Mushroom Pizza. Stop be and check out all of her great recipes! Thanks for such a yummy recipe, Haley! If you were featured, grab an "I've Been Featured" button to show how awesome you are! NOW - ON TO THE PARTY!